This Yantra originates from ancient Islamic sorcery spells to summon a Hazrat [in the context of this article meaning a Presence]. The Presence should be taken to be the Spirit of a departed soul of a person belonging to higher spiritual level [Mrit Atma] or an evolved Spirit. The Voodoo Spell described by me in this post is a dangerous Tantric experiment and I have written about it only for the sake of giving information about ancient Indian Occult Spells. 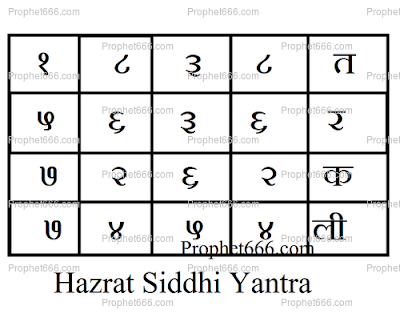 The Yantra Sahara to summon a Hazrat is as follows – The Yantra Prayoga should be performed on any Friday evening. The Hazrat Siddhi Yantra, which is shown by me in the image, should be prepared on white paper using black colored ink. A wick should be prepared by mixing the ash of a frog with cotton [Kapas Me Medak Ki Rakh Milake Batti Banana]. This wick should be put in an Oil Lamp and worshipped by offering it flowers and Agarbatti. A boy or girl of about 10-11 years from a good family having Dev Gan in his or her Kundali should be called and the Hazrat Siddhi Yantra should be kept in front of the Oil Lamp and worshipped by offering it flowers and Agarbatti. The child should be made to sit in front of Oil Lamp and the Yantra should be given to the child. The child should be told to burn the Yantra to ash by holding it over the Oil Lamp. The ash of the burnt Yantra should be collected and mixed with Sesame Oil [Til Ka Tel] to prepare a paste. This paste should be rubbed on the palms of the child. Then the practitioner should ask whatever questions whose answers he wants to the child. The Hazrat will answer the question through the mouth of the child. Note- It is difficult to vouch for this spell, as it is likely to involve a certain secret procedure apart from what is mentioned above. I have not personally witnessed or heard about this Spell being successfully tested by anyone.